IDX Broker can send new leads to your Top Producer account automatically. If you use other Top Producer products, but don't currently subscribe to Top Producer 8i, you may request more information about that here. If you want to use an email to update your CRM, find information here. Note: If you are an agent in an IDX Office account and not the primary client, see this article about integrating with Top Producer. Step 1 - Log in to your IDX Broker control panel. Step 2 - Click Leads in the main menu, and Lead Registration Preferences in the submenu. Step 3 - Switch from simple to Advanced mode, then click the CRM Integration tab. Step 4 - In the Top Producer section, select Yes for "Push All New Leads to Top Producer 8i" and click Save Changes at the bottom of the screen. Step 5 - Copy your Username and Password into a text file. You will need to add these values in the Top Producer Lead Provider setup. Step 6 - Login to your Top Producer 8i account. Click on your account name and go to Settings. Step 7 - Click on Contacts from the Settings menu, next click on My Leads. Step 8 - Click the text link at the very bottom of the page on the left, it says "Add Lead Provider". Step 9 - This will expand a new section. 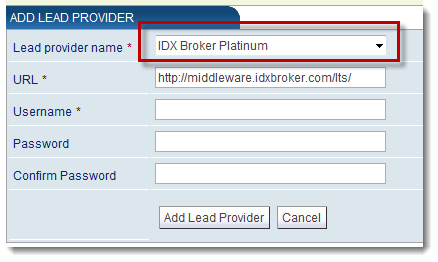 Select "IDX Broker Platinum" from the drop-down list for "Lead provider name". Enter the username and passwordprovided by IDX Broker. Step 10 - Click the Add Lead Provider button to save. IDX Broker should display as a lead provider and status should be "Active." All new IDX Broker leads will now be pushed to your Top Producer Account! Important: Your existing contacts will NOT automatically import into Top Producer. You will need to do this manually using the 8i import utility. NOTE: If you set up IDX Broker as a lead provider in Top Producer prior to June 11, 2014, you should delete the lead provider and then re-establish it if you have any difficulty finding your IDX leads in Top Producer. , you may request more information about that here.